Caleb Jesse Harn was born on 26 December 1836 at West Falls, Frederick Co., Maryland.2,3 He was the son of John (II) Harn and Charlotte Hay. Caleb Jesse Harn died on 15 January 1862 at Camp Worman, Frederick Co., Maryland, at age 25.2,3 He was buried in 1862 at West Falls, Maryland. Caleb Jesse Harn was a Teacher/Farmer. Never married.3 Camp Worman, MD was near Frederick, MD. Jesse Harn enlisted or mustered on Sept 6, 1861, rank of Private. Ellen Dorcas Harn Manuscript. The cause of death was Typhoid fever, brought on by camp-life exposure. In Civil War, Company B, 1st MD Regiment, Potomac Home Brigade. [S118] L. Allison Wilmer History & Roster of Maryland Volunteers, War of 1861-1865, Vol I,1898, pg 494, I (Baltimore, MD: Guggenheimer, Weil & Co., 1898). Hereinafter cited as Hist & Roster of Maryland Volunteers, War of 1861-1865. Her married name was Duval. Her married name was Bellison. [S2257] Find a Grave Inc., Find a Grave, database and images (: accessed Mar 2014), Mary Ann Bricker Harn (1821-1901) gravestone photograph, memorial no. 36109248, Fairlawn Cemetery, Oklahoma City, Oklahoma Co., Oklahoma, photograph © Shelly K Cherry, 2014. [S119] Letter from Nancy Louise (Perry) Harn (6721 S. 66th E. Ave.,Tulsa, OK) to Steven Harn Redman, 20 May 1991; Steven Harn Redman (2633 N. 1600 E., Layton, Davis Co., UT). [S2257] Find a Grave Inc., Find a Grave, Mary Ann Bricker Harn (1821-1901) gravestone photograph, Oklahoma Co., OK; Feel free to use my photos in your personal research since after all, that's one reason I take the photos. I have received a lot of requests recently to post these photos on Ancestry - please consider this as permission to do so, but PLEASE give a photo credit to "Shelly K Cherry (#12116408) - Find A Grave" as I have spent so much time and effort to take and post all these photos. Find A Grave Memorial# 63852013. Rev. Alvin Dighton Williams was a Free Will Baptist Preacher. Ellen Dorcas Harn Manuscript. Following from book, PAST AND PRESENT OF ADAMS COUNTY NEBRASKA, Volume II, pub in 1916 by S.J. Clarke Publishing Co., page 307-311. Alvin Dighton Williams was born October 3, 1825, at Smithfield Center, Bradford county, Pennsylvania, the son of Phineas Cromwell Williams, who in turn was an only son. The latter left Connecticut about 1820. He was orphaned at the age of ten years and had but little educational opportunity. He came of Welsh and English ancestry and tradition says that his ancestors were of the same branch as Oliver Cromwell's. The Williams family in Canticle were generally well educated and tradition says that Thomas Williams was offered the presidency of Yale College but declined because of his connection with Oliver Cromwell and his fear of prominence. Phineas Cromwell Williams became a carriage maker and farmer and devoted his life to those pursuits. In politics he was a Whig and an ardent admirer of Henry Clay. He wedded Marilla Loomis of Troy, Pennsylvania, having spent his boyhood and youth upon a farm near that place. The Loomis family were English people from Connecticut and her mother's mother, a Godard, was Scotch-Irish. Both Mr. and Mrs. Phineas Cromwell Williams were members of the Freewill Baptist church. Their son, Alvin Dighton Williams, attended Whitestown Seminary and Hamilton College of New York and upon graduation in 1849 received his degree. Many years later the degree of Doctor of Divinity was conferred upon him by Quincy College, now Chaddock College of Quincy, Illinois, this honor being received in 1871. He worked his own way through the seminary and college, teaching and preaching and doing any work he could secure. At the time of his graduation he was ill with typhoid fever. He became of member of the Freewill Baptist church, having been baptized and received into the church of that denomination at Troy, Pennsylvania, June 2, 1839. Two years later he was licensed by the church to preach and given a quarterly meeting license by the Bradford and Tioga meeting in 1842. He was ordained at Carolina Mills, Rhode Island, in 1848 and became pastor of the church there for a time later resuming the work after his graduation. During his college days he read a great deal of English literature and developed a taste for the best which he continued to cultivate and which he transmitted to his children. He bought books as he could afford them and acquired many by writing for publishers. When he came to Nebraska he brought with him a library of between fifteen and twenty hundred volumes. It was in 1851 that Rev. Williams accepted a call from the church in Pawtucket, Massachusetts, now Rhode Island, remaining there for four and a half years, during which time he increased the church membership to more than twice its original number. In 1855 he assumed the pastorate of the church at Lawrence, Massachusetts, and undertook the work of raising money for a new house of worship which was finished in 1857. An all winter revival trebled the membership. In 1857 he suffered a nervous breakdown and a throat trouble developed into bronchitis which never afterward entirely left him. Physicians said he must leave the New England climate and recommended Minnesota. In the fall the family removed to Minneapolis where he took the pastorate of a Freewill Baptist church, but the throat trouble eventually obliged him to give up preaching and he devoted his time to teaching, writing and publishing papers. He established the Freewill Baptist Quarterly, managing it for three years and finally becoming editor. He was principal of the Minnesota Seminary at Wasioja, Minnesota, until the war called forth the young men in attendance. He then went to Cheshire, Ohio, where for a year he was principal of an academy. 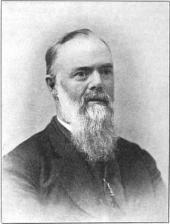 He started the West Virginia College at Flemington, West Virginia, and served for several years as president. In 1871 he came to Nebraska and served for one year as president of the State Normal School at Peru. In August, 1872, he arrived in Adams county, Nebraska, and settled on a quarter section, cornering on the townsite of Kenesaw on the northeast, being the first permanent settler within six miles. He built the first permanent house and put down the first well. He bought railroad land and at one time had nearly eight hundred acres. He won a prize of forty acres near Firth for the best article on sheep raising in Nebraska, the prize being offered by the Nebraska State Journal. He also started the Kenesaw Times, later published by his son, and for one year he published the Register at Lowell. Subsequently he established and published the Hastings Nebraskan, of which he had charge for several years. He served for a number of years as a trustee of Nebraska Hospital for the Insane at Lincoln and as a member of the state board of agriculture. At the same time he was conducting his private business interest, both wisely and well. He developed a number of farms near Kenesaw and proved up on a timber claim northwest of the town. During the '70s he acquired eight hundred acres of land in Nebraska, mostly in Adams county, and at his death he left an estate valued at about fifteen thousand dollars, his land bringing ten thousand dollars. His library of from twelve to fifteen hundred volumes was given to the Oakland City College of Indiana, of which he was president at the time of his demise. While in Kenesaw Mr. Williams assisted in building a Freewill Baptist church and organized the church membership. He also aided in organizing the Hastings, Aurora and Nemaha River quarterly meeting, as chairman of the executive committee of the Nebraska yearly meeting. He organized churches at Marshall, Pleasant Plain, Long Branch, and Lincoln, Nebraska. About 1890 he went south and worked among the General Baptists. He became president of the Oakland City College of Indiana and was thus identified with educational interests at the time of his death. He had been state superintendent of schools in West Virginia in 1869 and 1870, and was principal of the State Normal School at Peru, Nebraska, in 1871-2. He held other positions of public trust, being chaplain of the Minnesota house of representatives between 1857 and 1860. Always a stalwart champion of the cause of temperance, he was worthy chief of the Good Templars in Minneapolis and in 1860 was a delegate to the national convention which met in Nashville, Tennessee. He was made a member of the Association of General Baptists in 1891, so continuing until 1894 and was its moderator in 1891-2. In politics he was a republican from the organization of the party until his death. He supported the party as editor of weekly newspapers- the Kenesaw Times, Lowell Register, and Hastings Nebraskan- and by correspondence to different papers including the Nebraska State Journal. While in Minneapolis about 1858 he joined the Masons and the Good Templars and was a delegate from the latter to the convention in Chicago at which was organized the prohibition party, though he opposed the organization, believing that the temperance movement had better remain non-political. During the senior year of his college days he was elected retiring president of the Phoenix society and also of the Delta Upsilon fraternity and was editor of college papers. On the 25th of April, 1850, at West Falls, Maryland, Mr. Williams wedded Sarah Anne Harn, daughter of John and Charlotte (Hay) Harn, the former of English and the latter of English and German descent. They settled in Frederick county, Maryland on a farm near Mount Airy. Mrs. Williams was the eldest in a family of nine. She educated herself and assisted her two sisters in securing a course at Cedar Hills Seminary for Young Ladies at Mount Joy, Pennsylvania, of which Rev. N. Dodge was principal and in which Mrs. Williams was an assistant teacher at the time of her marriage. She and her sister, Ellen D. Harn, were the first teachers of Frederick county, Maryland. Her oldest brother, Rev. George U. Harn, was a minister of the Church of God. He became identified with the abolition movement, joined the republican party on its organization and was killed during the Civil war. Her brother Jesse died in the hospital during his service and another brother, Thomas, died from the effects of wounds. The children of Rev. and Mrs. Williams were Cromwell Harn, deceased; Emma Loomis, the wife of I.D. Evans; Mary; Minnie, who has passed away; Katie, the wife of Joseph R. Thrall; and George Thomas, who married Miss Grace Barton of Kenesaw and is now residing in Denver, Colorado. It would be almost tautological in this connection to enter into a series of statements as showing Rev. Williams to be a man of broad scholarly attainment, for this has been shadowed forth between the lines of this review. Further evidence, however, of his position as a man of marked mentality is the fact that he was the author and publisher of various volumes including the Rhode Island Freewill Baptist Pulpit; Memories of Free Communion Baptists; Four Years of Cooperation in Nebraska; Life of Benini Stinson; The Christian Church and its Institutions; and the Beginning of an Autobiography. After making a trip to Florida for his health he died at his home in Kenesaw, December 31, 1894. Following from book, PAST AND PRESENT OF ADAMS COUNTY NEBRASKA, Volume I, Judge Wm. R. Burton, editor, pub in 1916 by S.J. Clarke Publishing Co., pg 376. Doctor Williams was a graduate of Hamilton College, New York, and at different times held pastorates with the Free Baptist Church at Carolina Mills, R.I; Pawtucket, R.I; Lawrence, Mass; Minneapolis and Fairport, Minn. He served as the head of several schools among others, principal of the Nebraska State Normal at Peru and Oakland City College, Oakland, Ind. Among his literary productions are "History of the Free Baptists in Rhode Island," "History of the Free Communion Baptists," "Four Years of Co-operation in Nebraska," "The Church and Its Institutions" and a biography of Rev. Benoni Stinson, the originator of the General Baptist denomination in the United States. Following from the book, ADAMS COUNTY: A STORY OF THE GREAT PLAINS, by Dorothy Weyer Creigh, 1972, published by Adams County-Hastings Centennial Commission, Hastings, Nebraska, page 513. Kenesaw School District 3 was formed January 5, 1872, A.D. Williams was elected treasurer. Following from book, PAST AND PRESENT OF ADAMS COUNTY NEBRASKA, Volume I, Judge Wm. R. Burton, editor, pub in 1916 by S.J. Clarke Publishing Co., pg 341. On February 8, 1878, A.D. Williams, who had established a weekly paper in Kenesaw, the Kenesaw Times, removed the plant to Hastings and changed the name of the paper to the Central Nebraskan. In 1879, Mr. I.D. Evans, now of Kenesaw, was associated with Mr. Williams in the publication of the paper. After the Central Nebraskan had been published about two years the name was changed to the Hastings Central Nebraskan. Following from book, PAST AND PRESENT OF ADAMS COUNTY NEBRASKA, Volume I, Judge Wm. R. Burton, editor, pub in 1916 by S.J. Clarke Publishing Co., page 367-368. It is fortunate for the annals of Kenesaw that the first actual settle in that vicinity, Dr. A.D. Williams, was a man who wielded a facile pen and also had a penchant for making accurate records. "The railroad was laid out across this section and finished," wrote Doctor Williams, "in June, 1872, through to Kearney. The Kenesaw townsite was laid out a little before but the depot was not built until along in the fall-I believe the latter part of October or the first of November." Mr. Williams' house on the southeast quarter of section 26, 8, 12, was designated by the government as the location of the postoffice, and A.D. Williams appointed postmaster. The first permanent settler anywhere near Kenesaw was A.D. Williams on the southwest quarter of section 28, 8, 12, August 16 1872. He came thither in a 'prairie schooner,' and he with Mrs. Williams, Katie and George lived three weeks in the covered wagon box, setting up the cook stove outside of it, in a kitchen bounded only by the horizon. A.D. Williams died in Kenesaw July 9, 1894. Judge Wm. R. Burton, editor, pub in 1916 by S.J. Clarke Publishing Co., pg 373. A.D. Williams account of Kenesaw School District: "Early in 1873, it was found that there were twenty-seven children of school age in the district, in which there was a large amount of taxable railroad land and property, while the settlers were nearly all homesteaders, and paid very little taxes. So A.D. Williams proposed that $4,000 of bonds be issued, running for only five years, so that the burden would rest largely on the two railroads-most of the land being Union Pacific land-before the settlers would pay much taxes. "Strange to relate there was opposition to the proposition, most of it from people who had a good supply of children and next to no taxes. But the bonds were issued, the house built in 1874, and both the railroads and some of the homesteaders kicked in." WILLIAMS, REVEREND ALVIN DIGHTON, deceased, late of Kenesaw, Neb., was the first pioneer settler within a radius of six miles of Kenesaw, he having located there in August, 1872. He came from Peru, Neb., where for one year he was president of the state normal, resigning to move to his farm. He came to Peru from Flemington, W. Va., where he had been president of the Free Baptist College, known as the West Virginia College, of which he was the first president, and was also state superintendent of public instruction of West Virginia. He was educated at Whitestown Seminary and Hamilton College, New York, graduating in the class of 1849, and was pastor of the church of Lawrence, Mass., this being the largest congregation of Free Baptists in the state. Throat trouble caused him to resign his pastorship to seek health in the west. For a time he was pastor in Minneapolis, Minn., resigning to become president of the Wasioja Seminary in Dodge county, Minn., but the Civil War broke up his school. He then became president of the Cheshire Academy in Ohio. In 1869 he was a delegate from Minnesota to the first prohibition convention at Chicago. He did not approve of taking the temperance cause into politics and hence did not affiliate with the prohibition party. He was always a republican in politics, and edited the Kenesaw Times, the Lowell Register, and the Hastings Nebraskan, first called the Central Nebraskan. In Minnesota he edited and published the Minnesota Beacon, a Good Templar paper. In Massachusetts he was one of the editors of the Free Baptist Quarterly, also of the Freewill Baptist Review in Minnesota, and was chairman of the Free Baptist church state committee for organizing churches in Nebraska. He was for many years a member of the board of trustees of the insane asylum at Lincoln, Nebraska, and also a member of the Nebraska state board of agriculture and interested and active in the Nebraska state fair. He wrote much for the Nebraska State Journal, and was an active and influential factor in the upbuilding of the state of Nebraska, morally, religiously, and materially. He at one time owned about 800 acres of land near Kenesaw, and received a prize of forty acres of land near Firth for an essay on sheep raising in Nebraska. In the nineties he went from Nebraska to Oakland City, Ind., and raised the money, founded, and became president of the Oakland College of the general Baptist denomination. He gave $10,000 and his library to this school, having worked his own way through college and knowing the value of an education. He was born October 15, 1825, at Springf1eld, Bradford county, Pa., and was the son of Phineas Cromwell and Mary Marilla (Loomis) Williams. The former was born in Connecticut and the latter in Pennsylvania. He was married to Miss Sarah Harn of Frederick county, Md., daughter of John and Charlotte (Hay) Harn. She was a native of Baltimore. Mrs. Williams was a graduate of Cedar Hill Seminary, and taught in this school for some time prior to her marriage. To them were born six children: Cromwell Harn, who died in infancy; Emma Loomis, wife of I. D. Evans, Kenesaw, Neb. (see sketch in this work) ; Mary Harn, of Kenesaw; Minnie, who died at the age of twenty-two, a graduate of the Nebraska State University, class of 1881; Kate, now Mrs. Joseph R. Thrall. Hemet, Cal, and George Thomas, of Denver, Colo. As a boy at home he published the Desert Home Times and later the Kenesaw Times, and has been for over twenty years a worker on the Denver papers. Mrs. Sarah Harn Williams was an active co-worker with her husband in the home and also in religious and social work. She was a member of the Woman Suffrage Association and was in the early days president of the Free Baptist Woman's Mission Society for Nebraska and Kansas. The burden of the pioneer life, the management of their large farm, and the care and education of their children fell largely on her. Her death took place at Kenesaw, February 4, 1901. Her daughter, Mary Harn Williams, of Kenesaw. was educated in the Peru Normal and the Nebraska State University. She was for some years in the office of the Kenesaw Times, and was associated with Mrs. Colby in the organization of the suffrage association and in work on the Tribune at Beatrice, and was for ten years in the government printing office at Washington, D. C. She is corresponding secretary of the local suffrage club, and in 1906 was elected corresponding secretary of the Nebraska Woman Suffrage Association and later a member of the national executive committee. She is a member of the W. C. T. U., and is local correspondent for the Adams County Democrat, of Hastings. [S120] B. Esther (Oviedo) Harn, "E.B. Harn Sheets, FHL film 1036595, # 186,190,191,193,194", Feb 1977 (18921 Knapp St., Northridge, CA 913243). Hereinafter cited as "E.B. Harn Sheets, FHL film 1036595." [S121] Judge Wm. R. Burton Past & Present of Adams Co , Nebraska, Vol II, 1916, page 307-311, II (Chicago, Illinois: S.J. Clarke, 1916). Hereinafter cited as Past & Present of Adams Co., Nebraska. Ellen Dorcas Harn Manuscript. In Civil War, 1st Sgt., Company A, 3rd Md Potomac Home Brigade. Martin Luther Grove was a Tobacco Farmer. Ellen Dorcas Harn Manuscript. The cause of death was Typhoid Fever. Could be John Caleb Hearne, son of William Hearne. [S86] B. Esther (Oviedo) Harn, "E.B. Harn Sheets, FHL film 1036595, # 16", Feb 1977 (18921 Knapp St., Northridge, CA 91324). Hereinafter cited as "E.B. Harn Sheets, FHL film 1036595." Female (?) married Caleb (I) Harn, son of William Hearne and Elizabeth (?). Gail Evelyn Schneider is the daughter of Harry Charles Schneider and Evelyn Ann Purdy. Cindy Lou Harn was born on 5 December 1955 at Faribault, Rice Co., Minnesota, at 5:07 AM, weighing 7 lbs and 13 ounces.1 She died on 6 December 1955 at Faribault, Rice Co., Minnesota; Death was recorded as "Baby girl Harn".2 She was the daughter of Gerald Lewis Harn and Mary Lou McCarthy. Cindy Lou Harn was buried at Calvary Cemetery, Faribault, Rice Co., Minnesota. Her Ancestral File Number is 1V1V-ZQ2. Obituary notice, Faribault Daily News, 06Dec1955, pg 4, col 7. [S123] Cindy Lou Harn entry, birth, Rice County Courthouse, Faribault, Rice Co., Minnesota. [S124] Cindy Lou Harn entry, SOURCE: Death Record, Rice Co , MN, Book 2, page 130, line 2, Rice County Courthouse, Faribault, Rice Co., Minnesota. As of 1940,her married name was Spilman. Doris Alice Harn was a beautician. In 1941 when father died, Don and Doris lived in St. Paul, Minnesota. Doris was Lutheran as a young girl. Rebaptized in 1955, in the Seventh Day Adventist Church. Their home for many years in Mantorville, was sold in 1996. Due to medical reasons, Don and Doris were placed into a nursing home in 1996. Doris Alice Harn was a Seventh Day Adventist. She lived in 2003 at Fairview Nursing Home, Dodge Center, Dodge Co., Minnesota. Mantorville- The funeral for Doris A. Spilman will be at 10:30 a.m. Friday at First Congregational Church in Mantorville, with the Rev. Hubert Bardin of the Seventh-Day Adventist Church in Dodge Center and the Rev. Jerry Platz of the Congregational Church officiating. Burial will be in Evergreen Cemetery in Mantorville. Mrs. Spilman, 83, of Dodge Center, formerly of Mantorville, died Sunday (July 13, 2003) at Fairview Nursing Home in Dodge Center where she had lived since 1996. Doris A. Harn was born Jan. 2, 1920, in Red Wing, grew up in Faribault and in 1938 attended beauty school in St. Paul. On Sept. 15, 1940, she married Donald W. Spilman in Northwood, Iowa, and they moved to Mantorville in 1949. She was a beautician and her husband was a barber. He died in 1998. She was a member of the Seventh-Day Adventist Church in Dodge Center, volunteered with the American Cancer Society and was a member of the Mantorville VFW Auxiliary. [S126] Letter from Doris Alice (Harn) Spilman (Mantorville, MN) to Steven Harn Redman, Oct 1991; Steven Harn Redman (2633 N. 1600 E., Layton, Davis Co., UT). Ancestry.com. Iowa, Marriage Records, 1880-1940 (database on-line). Lehi, UT, USA: Ancestry.com Operations, Inc., 2014., unknown repository, unknown repository address. Hereinafter cited as Iowa Marriage Records, 1923–1937;. [S125] Letter from Doris Alice (Harn) Spilman (Mantorville, MN) to Steven Harn Redman, Feb 1991; Steven Harn Redman (2633 N. 1600 E., Layton, Davis Co., UT). [S1597] Doris Spilman, unknown newspaper title, Minnesota, Jul 2003. 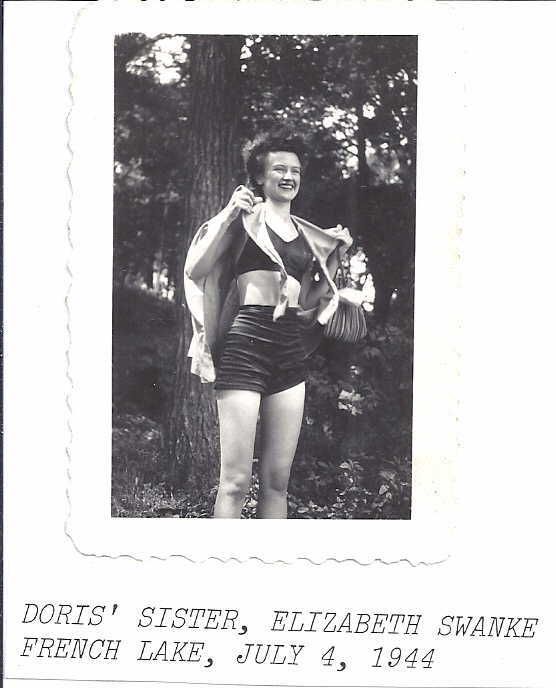 Hereinafter cited as Obituary Doris Spilman. Source Citation: Year: 1940; Census Place: Wells, Rice, Minnesota; Roll: T627_1953; Page: 1A; Enumeration District: 66-30. Ancestry.com. 1940 United States Federal Census (database on-line ). Provo, UT, USA: Ancestry.com Operations, Inc., 2012. Elizabeth Jean Harn was born on 2 July 1922 at Red Wing, Goodhue Co., Minnesota. She was the daughter of Oscar Cecil Harn and Delta Ann Perkins. Elizabeth Jean Harn was baptized on 25 July 1924 at Faribault, Rice Co., Minnesota.1 She married Charles Swanke on 20 September 1940 at Duluth, Saint Louis Co., Minnesota.1 Elizabeth Jean Harn and Charles Swanke were divorced. Elizabeth Jean Harn died on 31 March 2003 at St. Paul, Ramsey Co., Minnesota, at age 80. She was cremated on 4 April 2003 at St. Paul, Ramsey Co., Minnesota. She was buried at Oak Ridge Cemetery, Faribault, Rice Co., Minnesota. Elizabeth Jean Harn was a beautician. Elizabeth Jean Harn was also known as Betty. She lived in September 1940 at Duluth, Saint Louis Co., Minnesota; living in Duluth when father died. Her married name was Swanke. Elizabeth Jean Harn was a Non-Denomination Protestant.1 She lived in 1965 at 601 Bancroft St., St. Paul, Ramsey Co., Minnesota; lived at this address from about 1965 till July 2000. In July 2000, moved from house lived in since about 1965, at 601 Bancroft, to an apartment 3-blocks away. The cause of death was In Oct 2000, due to intestinal infection went down to 85 lbs. In July 2002 at 82 pounds. Around that time, also diagnosed with an acoustic neuroma, which is a hearing nerve non-malignant tumor. Used chemotherapy to shrink the tumor. She lived in July 2002 at 516 Humboldt Ave., Apt #428, St. Paul, Ramsey Co., Minnesota. Her Social Security Number was 475-14-3442. July 2, 1922-March 31, 2003 St. Paul's Lifetime Beautician Survived by brother William Ham; sister, Doris Spilman of Faribault; and special friend Demetrio Casillas; many nieces and nephews. Preceded in death by parents Oscar & Delta Perkins Ham; two brothers David and Gerald Ham. A private service was held. Burial was in Oakridge Cemetery, Faribault, MN. Copyright (c) 2003 St. Paul Pioneer Press. [S127] Letter from Elizabeth Jean (Harn) Swanke (601 Bancroft Ave., St. Paul, MN 55107-3037) to Steven Harn Redman, Mar 1991; Steven Harn Redman (2633 N. 1600 E., Layton, Davis Co., UT). David Marshall Harn was born on 11 April 1923 at Faribault, Rice Co., Minnesota.1 He was the son of Oscar Cecil Harn and Delta Ann Perkins. David Marshall Harn was baptized at Methodist Church, Faribault, Rice Co., Minnesota. He married Celia Marie Stasney, daughter of John C. Stasney and Emma Anna Heyda, on 11 April 1945 at Holy Redeemer Catholic Church, Montgomery, Le Sueur Co., Minnesota. David Marshall Harn died on 30 May 1965 at Faribault, Rice Co., Minnesota, at age 42.1 He was buried on 2 June 1965 at Calvary Cemetery, Faribault, Rice Co., Minnesota. David Marshall Harn was a Part-time farmer, feedmill operator. He lived in 1941 at Faribault, Rice Co., Minnesota, when father died. Obituary notice, Faribault Daily News 01Jun1965, pg 10, col 7-8. He lived at Cannon City Twsp., Rice Co., Minnesota. [S128] David Marshall Harn entry, Birth, Rice County Courthouse, Faribault, Rice Co., Minnesota. William Oscar Harn is the son of Oscar Cecil Harn and Delta Ann Perkins. William Oscar Harn married Donna Ann McCarthy, daughter of William Charles McCarthy and Katherine Rose Sklenar, on 8 November 1950 at Mason City, Cerro Gordo Co., Iowa. George Warren McCarthy was born on 6 July 1925 at Faribault, Rice Co., Minnesota. He was the son of William Charles McCarthy and Katherine Rose Sklenar. George Warren McCarthy died on 8 February 1930 at Faribault, Rice Co., Minnesota, at age 4. He was buried at Faribault, Rice Co., Minnesota. The cause of death was intestinal obstruction for a duration of 2-days. OBITUARY: Faribault Daily News, 08Feb1930, pg 1 col 8. SOURCE: Birth Records, Rice Co., MN, Book D, pg 59, line 36. [S130] Edward James McCarthy entry, birth, Rice County Courthouse, Faribault, Rice Co., Minnesota. [S129] Letter from Joan Louise (Kukowski) McCarthy (3-3rd Ave., Landfall Terrace, St. Paul, MN 55128) to Steven Harn Redman, 02 Jun 1992; Steven Harn Redman (2633 N. 1600 E., Layton, Davis Co., UT). Geraldine Marie McCarthy is the daughter of William Charles McCarthy and Katherine Rose Sklenar. Geraldine Marie McCarthy married Lloyd Alexander Lien, son of Andrew Lien and Anna Lockrem, on 5 November 1955 at Faribault, Rice Co., Minnesota. Rear: Mary Lou Redman, Donna Harn, Jeri Lien. 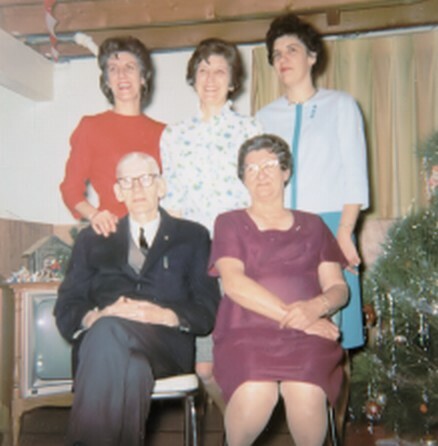 Bill and Donna Harn Family in 1970. Judy, Kathy, Linda, Bill, Donna. Donna Ann McCarthy was born on 31 October 1931 at Faribault, Rice Co., Minnesota; Donna was born at 4:07am. She was the daughter of William Charles McCarthy and Katherine Rose Sklenar. Donna Ann McCarthy was baptized circa 1931 at Faribault, Rice Co., Minnesota. She married William Oscar Harn, son of Oscar Cecil Harn and Delta Ann Perkins, on 8 November 1950 at Mason City, Cerro Gordo Co., Iowa. 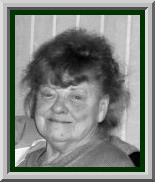 Donna Ann McCarthy died on 16 April 2009 at Faribault, Rice Co., Minnesota, at age 77. She was buried on 20 April 2009 at St. Patrick's Cemetery, Shieldsville, Rice Co., Minnesota. SOURCE: Donna Harn. Donna Ann McCarthy was a Catholic. She graduated in 1949 at Bethlehem Academy, Faribault, Rice Co., Minnesota. As of 1950,her married name was Harn. She retired in February 2000 at Minnesota State Academy for the Deaf, Faribault, Rice Co., Minnesota. The cause of death was spinal fluid cancer. The cause of death was spinal fluid cancer. She lived bt__ Jun 1977-__ Feb 2009 at 6960 French Lake Court, Faribault, Rice Co., Minnesota. 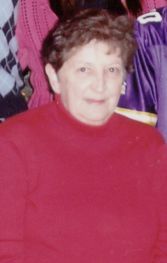 FARIBAULT - Donna A. Harn, age 77 of Faribault, passed away on Thursday, April 16, 2009 at St. Lucas Care Center in Faribault. Memorial Mass of Christian Burial will be held on Monday, April 20, 2009 at 2 p.m. at the St. Patrick Catholic Church in Shieldsville. Interment will be at the St. Patrick Church Cemetery. Visitation will be held on Monday from 1:30 to 2 p.m. at the church Arrangements are with the Parker Kohl Funeral Home of Faribault. 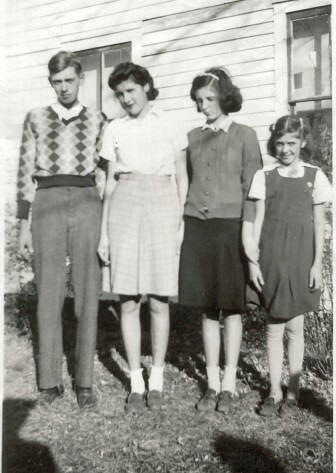 Born on Oct. 31, 1931 in Faribault, Donna was the daughter of William and Katherine (Sklenar) McCarthy. She attended Bethlehem Academy in Faribault and graduated in 1949. Donna married William (Bill) O. Harn on Nov. 8, 1950 in Mason City, Iowa. Donna and Bill lived many years in Richfield before moving to French Lake. After raising her children, Donna worked over 20 years at the Minnesota School for the Blind as a House Parent. While Donna's first love was Bill, her second love was traveling. With Bill, family and good friends, she took in sights across the world, in recent years visiting Ireland, Italy, France, England, Nova Scotia and Mexico. She enjoyed spending time with family and hosted many gatherings at her home at French Lake, entertaining loved ones with photos from her most recent travels and her delicious baking. Donna was a devout Catholic and member of the parish at St. Patrick Church in Shieldsville. (Stephen) Gray of Burnsville, Judy (Dennis) Anderson of Minnetrista, William Jr. (Namsun) Harn of Rogers, Kathleen (Joseph) Sherman of Lakeville, and Kristine Harn of Faribault; her sister, Geraldine Lien of Faribault; brother, Edward (Joan) McCarthy of St. Paul; 11 grandchildren, Kirsten, Naomi, Ryan, Reece, Michelle, Trenton, Sam, Ben, Tori, Alonzo and Peter; and many nieces and nephews, including very special nephew, Steve (Terri) Redman of Clearfield, Utah. She was preceded in death by her parents; sister, Mary Lou Redman; brother, George McCarthy; and much-loved in-laws. Memorials may be directed to the American Cancer Society. For guestbook and information please visit www.ParkerKohlFuneralHome.com. 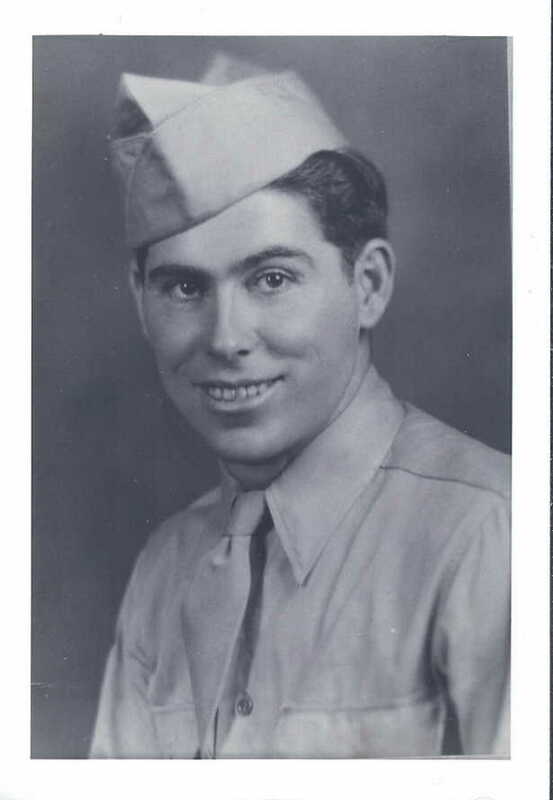 Donald Walter Spilman was born on 11 August 1917 at Jamestown, Stutsman Co., North Dakota. He was the son of Walter Scott Spilman and Marie Gail Davey. Donald Walter Spilman married Doris Alice Harn, daughter of Oscar Cecil Harn and Delta Ann Perkins, on 15 September 1940 at Northwood, Worth Co., Iowa.1 Donald Walter Spilman was baptized circa 1950 at Mantorville Congregational Church, Mantorville, Dodge Co., Minnesota.2 He died on 12 January 1998 at Minnesota at age 80. He was buried at Evergreen Cemetery, Mantorville, Dodge Co., Minnesota; Plot: 610 C.
Donald Walter Spilman was a barber. He lived at Fairview Nursing Home, Dodge Center, Dodge Co., Minnesota. His Social Security Number was 502-10-7661 issued in ND before 1951. Charles Swanke married Elizabeth Jean Harn, daughter of Oscar Cecil Harn and Delta Ann Perkins, on 20 September 1940 at Duluth, Saint Louis Co., Minnesota.1 Charles Swanke and Elizabeth Jean Harn were divorced. Celia Marie Stasney was born on 28 November 1921 at Minnesota.1 She was born on 28 November 1923 at Rice Co., Minnesota. She was the daughter of John C. Stasney and Emma Anna Heyda. Celia Marie Stasney was baptized at Holy Redeemer Catholic Church, Montgomery, Le Sueur Co., Minnesota. She married David Marshall Harn, son of Oscar Cecil Harn and Delta Ann Perkins, on 11 April 1945 at Holy Redeemer Catholic Church, Montgomery, Le Sueur Co., Minnesota. Celia Marie Stasney died on 15 March 2007 at District One Hospital, Faribault, Rice Co., Minnesota, at age 83.1 She was buried in March 2007 at Calvary Cemetery, Faribault, Rice Co., Minnesota. SOURCE: Celia Harn. SOURCE: Rice Co., MN Birth Record, Book D, page 456. Birth Record states child Stasney was born 26Nov1924. Celia Marie Stasney was a Catholic. Her married name was Harn. Celia Marie Stasney was a homemaker.1 She lived in 2005 at 1104 West Division St., Faribault, Rice Co., Minnesota. Following is the obituary for Celia Harn, from The Faribault Daily News Online (www.Faribault.com)"
FARIBAULT - Celia M. Harn, of Faribault, died Thursday, March 15, 2007, at the District One Hospital in Faribault. Memorial services will be held on Monday, March 19, 2007, at 1 p.m. at the Parker Kohl Funeral Home in Faribault, with Bernadette Tatge, pastoral minister of Divine Mercy Catholic Church, officiating. Interment will be at the Calvary Cemetery in Faribault. Memorial visitation will be held at the Parker Kohl Funeral Home in Faribault on Monday from 11 a.m. to 1 p.m.
Celia Marie Stasney, the daughter of John and Emma (Heyda) Stasney, was born Nov. 28, 1921, and raised on her family's farm in Montgomery, Minn. She attended country school in rural Montgomery. On April 11, 1945, she was united in marriage to David Harn in Faribault. He preceded her in death on May 30, 1965. Celia was a homemaker for most of her life. She enjoyed sewing, canning pickles, and caring for her flower and vegetable gardens and trees. She loved the farm life and visiting Carole and Tony's farm and their variety of animals. Celia also enjoyed her time with her grandchildren and three great-grandchildren. She is survived by her three children, Carole (and Tony) Bongers, Bob Harn, and Larry Harn (and Jeanne Taylor), all of Faribault; a daughter-in-law, Judy Harn of Faribault; seven grandchildren, Tammie Bongers (and Steve Dahl), Troy Bongers (and Wendy), Traci (and Mark) Thieding, Chris Bongers, Grady Harn, Hailey Harn and Hattie Harn; three great-grandchildren, Lexa Bongers, Holly Bongers and Alex Thieding; brother, John (and Rita) Stasney of Montgomery; two sisters, Evelyn Felix of Duluth and Alice Stoeckel of Faribault; two brothers-in-law, Richard Chodek of New Prague and Bill (and Donna) Harn of Faribault; and many nieces, nephews, and other relatives and friends. [S1804] Celia M. Harn 1921-2007, Faribault Daily News Interactive (obituary Celia Harn), www.faribault.com, Friday, 16 Mar 2007, n/a. Hereinafter cited as Faribault Daily News Interactive (obituary Celia Harn). Lloyd Alexander Lien was born on 15 January 1921 at Dennison, Goodhue Co., Minnesota. He was the son of Andrew Lien and Anna Lockrem. Lloyd Alexander Lien married Geraldine Marie McCarthy, daughter of William Charles McCarthy and Katherine Rose Sklenar, on 5 November 1955 at Faribault, Rice Co., Minnesota. Lloyd Alexander Lien died on 1 January 1993 at Faribault, Rice Co., Minnesota, at age 71. He was buried abt Spring 1993 at Vang Lutheran Cemetery, Dennison, Goodhue Co., Minnesota. The cause of death was complications from Leukemia. OBITUARY: Faribault (MN) Daily News 02Jan1993. Lloyd Alexander Lien was a Lutheran. He graduated in 1963 at Faribault High School, Faribault, Rice Co., Minnesota.4 Anthony Martin Bongers also went by the name of Tony. In 2002, Tony farms his land and also works at Lockerby Sheet Metal.5 In March 2005 Anthony Martin Bongers was a sheet metal worker and farmer. As of December 2009, Anthony Martin Bongers lived at 15364 Cabot Ave, Faribault, MN. [S1674] MN Birth Index 1935-2002, online www.ancestry.com, 1945-MN-015421. Hereinafter cited as MN Birth Index 1935-2002. [S131] Letter from Carole Ann (Harn) Bongers (15364 Cabot Ave., Faribault, MN 55021) to Steven Harn Redman; Steven Harn Redman (2633 N. 1600 E., Layton, Davis Co., UT). [S1740] Richard Edward Bongers website, online http://familytreemaker.genealogy.com/users/b/o/n/Richard-E-Bongers/GENE1-0006.html, (email of e-mail address). Hereinafter cited as Richard Edward Bongers website on 04 Oct 2006. [S2373] Tony Bongers, Boldt Funeral Home website, http://m.boldtfuneralhome.tributecenteronline.com/obituaries/events?obituaryId=759270, n/a, n/a. Hereinafter cited as Boldt Funeral Home website. [S1582] Letter from Carole Ann (Harn) Bongers (15364 Cabot Ave., Faribault, MN 55021) to Steven Harn Redman, Mar 2002; Steven Harn Redman (2633 N. 1600 E., Layton, Davis Co., UT). Jean Marie Spilman is the daughter of Donald Walter Spilman and Doris Alice Harn. Jean Marie Spilman married Newton A. (Skip) Kennedy, son of Everett Kennedy and Elizabeth (? ), on 26 June 1971 at 1st Congregational Church, Mantorville, Dodge Co., Minnesota.2 Jean Marie Spilman and Newton A. (Skip) Kennedy were divorced in 1984. Jean Marie Spilman married Daniel Paul Bartel, son of Paul Emil Bartel and Dorothy Seykora Barrel Meek, on 15 September 1991 at Orlando, Orange Co., Florida. [S132] Letter from Doris Alice (Harn) Spilman (Mantorville, MN) to Steven Harn Redman, Feb 1991; Steven Harn Redman (2633 N. 1600 E., Layton, Davis Co., UT). [S133] Letter from Donna Kaye (Spilman) Schak (unknown author address) to Steven Harn Redman, Sep 1996; Steven Harn Redman (2633 N. 1600 E., Layton, Davis Co., UT). [S1555] Letter from Elizabeth Jean (Harn) Swanke (516 Humboldt Ave., Apt #428, St. Paul, MN 55107) to Steven Harn Redman, 07 Jul 2000; Steven Harn Redman (2633 N. 1600 E., Layton, Davis Co., UT). [S1589] Letter from Betty Jane (Spilman) Thompson (1000 1st Place NW, Kasson, MN 55944) to Steven Harn Redman, May 2002; Steven Harn Redman (2633 N. 1600 E., Layton, Davis Co., UT). Delores Lynn Spilman is the daughter of Donald Walter Spilman and Doris Alice Harn. Delores Lynn Spilman married Stanley Arthur Brown in 1980 at Hinsdale, DuPage Co., Illinois. Doris Ann Spilman is the daughter of Donald Walter Spilman and Doris Alice Harn. Doris Ann Spilman married Richard Frederick Tilbury, son of Donald Elmer Tilbury and Joyce Frances Eberhart, on 25 March 1967 at Mantorville, Dodge Co., Minnesota.2 Doris Ann Spilman and Richard Frederick Tilbury were divorced. [S134] Letter from Doris Ann (Spilman) Tilbury (unknown author address) to Steven Harn Redman, Oct 1996; Steven Harn Redman (2633 N. 1600 E., Layton, Davis Co., UT).